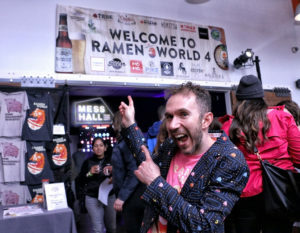 Ramen World 4 at Mess Hall: How Did I Manage to Miss 1, 2, and 3? 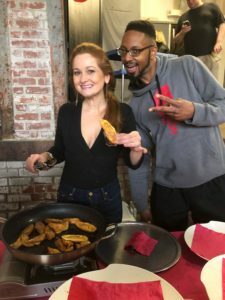 As a restaurant obsessive living in the DC area, I relish the fact that in any given month there is an abundance of food events where I can explore the offerings of local chefs and restaurants all under one roof. More often than not, these gatherings are fundraisers, so I can stuff myself silly and support a charitable cause. This is a win-win on so many levels. 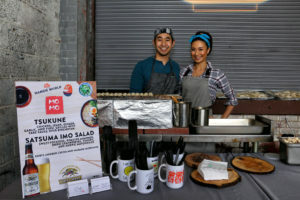 Last weekend Mess Hall presented “Ramen World 4” with a portion of the proceeds benefiting DC Greens. I somehow missed out on Ramen World 1, 2, and 3, so I approached this event with a wide-eyed innocence. Mess Hall gatherings are always well-planned and executed, and Ramen World 4 exceeded my expectations. Mess Hall founder Al Goldberg says the event was conceived just for attendees to have fun. “People love Japanese culture, and this is now our biggest event of the year.” His Pac-Man jacket demonstrates how fully into the theme he’s willing to dive. 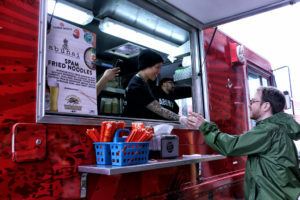 I rolled out of Mess Hall dazzled by the quality of the ramen and ramen-inspired dishes, and amazed by how much food I was able to consume at this all-you-can-eat ramen-palooza. Himitsu. 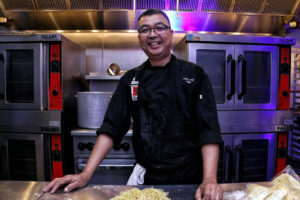 Chef Kevin Tien is a superstar. The restaurant he owns with Carlie Steiner tops Best DC Restaurant lists everywhere, including Bon Appetit. It was just announced that the chef will appear on “Iron Chef Gauntlet,” scheduled to premiere on the Food Network on April 4. 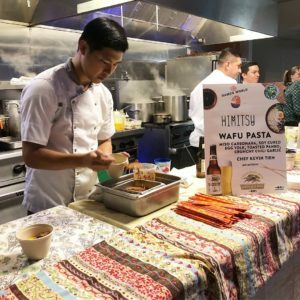 His Wafu Pasta, combining miso carbonara, soy cured egg yolk, toasted panko, and crunchy chili garlic, was a crowd favorite. Daikaya, Haikan, Bantam King. 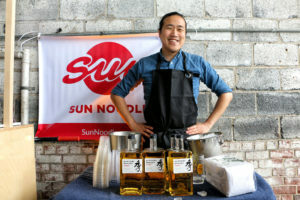 Chef Katsuya Fukushima served an Impossible Ramen Burger, a plant-based burger that he helped develop. 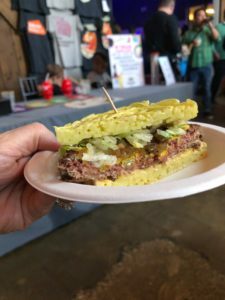 The burger is made from wheat protein, coconut oil, potato protein, and an ingredient called heme, which is what actually makes meat smell, sizzle, and bleed. Surround the burger with a ramen bun, and you have something that’s incredibly tasty, and it truly is impossible to believe that you aren’t eating meat. The Source by Wolfgang Puck. 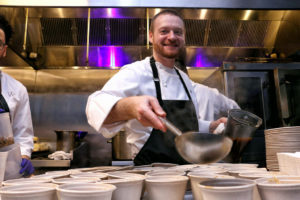 Chef Russell Smith served up a powerfully flavorful bowl of hot and sour ramen with pork belly, tofu, wok fried mushrooms, and Sichuan peppercorns. Nomad Dumplings. Mess Hall Member Karen Hoefener proudly dished up Xinjiang spiced pumpkin and fennel dumplings. Nomad Dumplings are a new discovery for me, and I expect there to be more of these in my future. These frozen, pre-cooked dumplings are available in a variety of flavors, and can be purchased online or at several area grocery stores, including Glen’s Garden Market in DC and Dawson’s Market in Rockville. More photos from Ramen World. Stay tuned for future events from Mess Hall including the next “New Kitchens on the Block” where you can discover upcoming DC restaurants, before they open. *DC Greens uses the levers of food education, food access, and food policy to advance food justice in the nation’s capital.